The Institute of Contemporary Development has published its monthly analytical bulletin for May. The main topics of this issue are: the G20 and its critics; the outlook for a transatlantic partnership; and structural maneuvers in the Russian oil and gas sector. 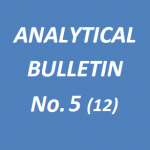 The annotation of Analytical Bulletin No.5 (12) can be found below. The full text of the bulletin in Russian can be found here. The agenda of the G20 is determined by a constantly changing assortment of problems, risks and limitations of the global economy. However, despite this variability, a certain common driver is apparent – the main focus of both national regulatory actions and global governance is systemic risks, the mitigation of which requires large-scale structural reforms. This is leading to strengthening of the mid-term components of the G20 agenda, simultaneously demarking the threshold beyond which the G20 increasingly transforms into a group for managing systemic risks and addressing long-term challenges, while retaining its functions as an anti-crisis manager. The agenda for the Russian presidency includes refining and renewing the priorities of the G20 for the 3-5 year perspective. In the mid-term it would be prudent to compile a substantial portion of the components of the next action plan. The St. Petersburg summit could itself represent the starting point for a new round of summits connected by common aims, the pursuit of which could allow for the gradual structuring of global governance to correspond with the transition of the global economy to a new phase of development. Experts of the Lowy Institute (Australia) commented on the present and future of the G20 in light of the upcoming Australian presidency of the group. Efforts aimed at the effective execution of interrelated tasks – providing greater clarity in the agreed aims and priorities, strengthening public outreach (including with external stakeholders), increasing transparency and improvement of accountability mechanisms – according to the Australian experts, should be at the core of the position of the Australian presidency. This, in turn, would permit progress in the process of establishing long-term standards which would be used by subsequent chair countries. This type of target-setting is also being actively promoted by Russia as the current chair country. This past February the US president and leaders of the European Union committed to begin in the second half of the year negotiations which are supposed to lead to the Transatlantic Trade and Investment Partnership agreement. The topic of the transatlantic partnership will also be brought up at the G8 summit at Lough Erne in June. The detailed development of the draft of the transatlantic trade bridge agreement is in itself a serious test for the global economic and political strategies of the United States and the EU, which regardless of the results of the negotiations are certain to face changes.